So I totally forgot to post my new video here on Friday. Oops! Well, here it is! This video is just a short one about different types of wigs. I hope it's helpful for anyone who doesn't know the difference. Anyhoo, I also changed my YouTube name to The Phantom Costumer. My sister suggested it and I couldn't refuse. 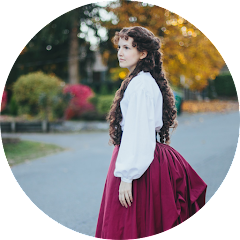 I'm still trying to decide if I should change the name of my blog to match, but I really like Adventures in Costuming. Any thoughts?